Make Delightful Animations with Swift! There’s no denying it: creating animations is one of the most enjoyable parts of iOS development. Animations are fun to create, they breathe life into your user interface, and they make your app a delight to use. In this book, you’ll learn about iOS animation in Swift from beginning to advanced through a series of hands-on tutorials and challenges, that make your app look and feel great. 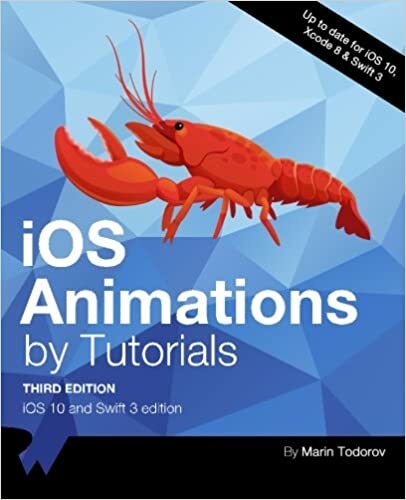 This book is for intermediate to advanced developers, who already know the basics of iOS and Swift development and want to dive deep into animations. View Animations: Start with the basics by learning how to animate views: size, position, color, and more. Springs: Make your animations bounce with realistic spring behavior. Transitions: Add subtle transitoins when you add or remove subviews. Keyframe Animations: Learn how to make complex animations with precise multi-stage timing. Animation and Auto Layout: Learn how to animate with Auto Layout by animating constraints. Layer Animations: Dive deeper and use layer animation for more advanced techniques. Shapes and Masks: Learn how to use shapes and layer masks for cool effects. Gradient Animations: Make moving gradients like the “slide to unlock” screen. Stroke and Path Animations: Animate lines moving over time along a path. 3D Animations: Rotate, translate, and scale your layers over time in three dimensions. And much more, including: Particle emitters, frame animations, third party animation libraries, and more! Marin Todorov is one of the founding members of the raywenderlich.com tutorial team. He is an independent iOS consultant and publisher, and also has a background in web and desktop development. Besides crafting code, Marin also enjoys blogging, writing books and speaking at conferences. He happily open sources code.